You can only catch and train Pokémon of a certain type. Once you capture your first Pokemon of that type, disregard any previous Pokemon on your team. If a Pokémon evolves to said type you may train it but evolve it ASAP. If a Pokémon changes to said type via Mega Evolution you are allowed to train it provided you Mega evolve it every time. Only Pokémon caught before the Elite Four are counted. To give a cop-out answer, almost all the types in these games are great for a Single Type Run. I’m serious, pick a type and you’re bound to have a good time. But what if you want the very best? In my opinion, the best of the best are Flying, Water, and Fighting. What these three types have in common are high diversity of strong Pokemon. You can have multiple variations of each type and easily cover their weaknesses. The hardest thing about their runs is picking your final six. I myself did a Fighting Run recently and it was tough for me to narrow it down. You have Chesnaught, Lucario, Toxicroak, Hawlucha, and so forth who can give you a great diversity of moves. Water Pokemon can give you a healthy team for role diversity in terms of defense, support, and attack (and Greninja is always nice). 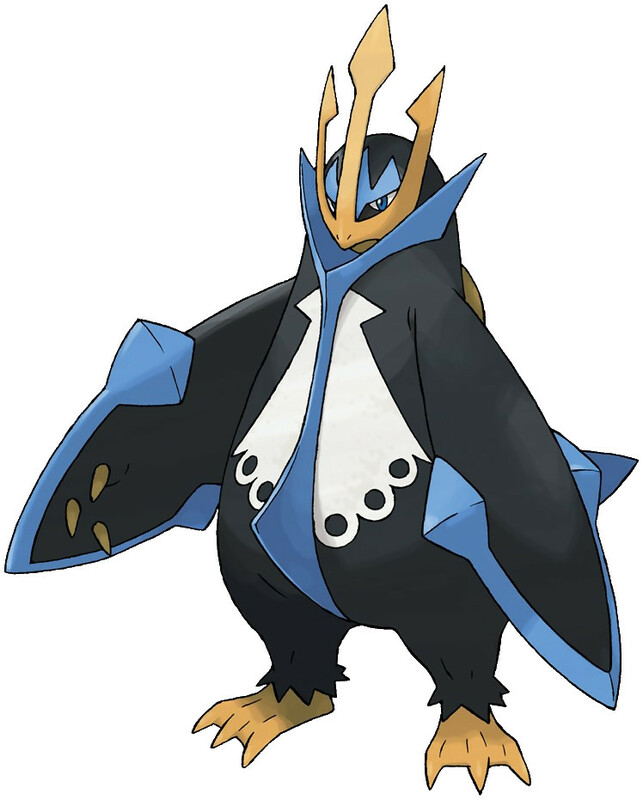 Flying Type also has a lot of gems, most notably Gliscor, Charizard, and Honchkrow. All of these types are available very early and consistently give you new Pokemon to play with as you progress. Like I said before, even the “worst” types in the game are still not bad, especially compared to the other games. But the worst would probably be Rock as it’s available relatively late compared to the other types. The first pokemon you can catch, Dwebble and Binnacle, are available shortly before you get to the second gym. Still though, this may be one of the best Rock Type runs in Pokemon due to the sheer abundance and diversity of them. You neutralize your weaknesses right off the bat thanks to the aforementioned Dwebble and Binnacle! So how about that? Also, when you arrive to Glittering Cave, shortly afterwards, you can catch a Solrock, Lunatone, Onix, and a Rhyhorn! So you go from drought to deluge in almost an instant! Also, you can’t go wrong with Tyrantrum. Dragon, Ice, Ghost, and Fire would be the other subpar types in these games but still, not too bad. For Dragon Pokemon, you get your first Pokemon, whether a Charmander or Axew, after the first gym and you have some weaknesses to watch out for. Still, this is a pretty solid team. Hydreigon, Garchomp, potentially Mega-Charizard X and Dragalge, and others give you a nice solid, strong team to fight with! Fire Pokemon also have weaknesses to Rock and, for Y, Water but at least you have Fennekin as your starter so you can play Fire right from the get go. Ice Pokemon have all their weaknesses covered which is a shock, but your first Pokemon, Eevee, won’t be acquired until after your first gym. The same goes for Ghost Pokemon who are also available after the first gym but have their weaknesses covered. On Route 6 you can catch a Nincada and a Honedge at the same time which is nice. First Pokémon: Scatterbug via Route 2 and Weedle (X)/Caterpie (Y) for Route 2 as well but you can catch them both in both versions at Santalune Forest. Weaknesses Covered? Regardless of versions, you’re good! First Pokémon: Axew via Connecting Cave after the first gym or Charmander in Lumiose City after the first gym for Pokémon X. Weaknesses Covered? No, X is weak to Dragon. Y is weak to Dragon and Ice. Weaknesses Covered? No, in Pokemon X, Rock is not neutralized. In Pokemon Y, Water and Rock are not neutralized. Weaknesses Covered? Yes, and in more ways than one. You can have several different team matchups and still have your bases covered. First Pokémon: Nincada and Honedge via Route 6 after the first gym. Weaknesses Covered? Yes, and you can even interchange some of these pokemon and still cover weaknesses fine. First Pokémon: Eevee via Trade in Camphrier Town after the first gym. First Pokémon: Dwebble and Binacle via Rock Smash in Ambrette Town. This is well into the game but is still before the second gym. Get the Rock Smash TM from the girl outside of the Aquarium. You can then get Rhyhorn, Onix, Solrock, and Lunatone almost immediately afterwards in Glittering Cave with the fossils following shortly afterwards. First Pokémon: Burmy via Route 3, before the first gym. Don’t worry, you’ll get a Riolu soon after via Route 22, also before the first gym. Weaknesses Covered? Yes and in more ways than one. Ground is covered by Ferrothorn, Durant, and Skarmory. Fire by Probopass/Aggron. Fighting by Mawile, Durant, Wormadam, and Skarmory. Weaknesses Covered? Yes, and in more ways than one, you can interchange some of these pokemon for others and still be fine. This entry was posted in Pokemon, Pokemon Single Type Run and tagged Bug Type, Dark Type, Dragon Type, Electric Type, Fairy Type, Fighting Type, Fire Type, Flying Type, Gamefreak, Ghost Type, Grass Type, Ground Type, Ice Type, Monotype Run, Nintendo, Normal Type, Poison Type, Pokemon, Pokemon X, Pokemon XY, Pokemon Y, Psychic Type, Rock Type, Single Type Run, Steel Type, video games, Water Type on April 5, 2019 by Andy. 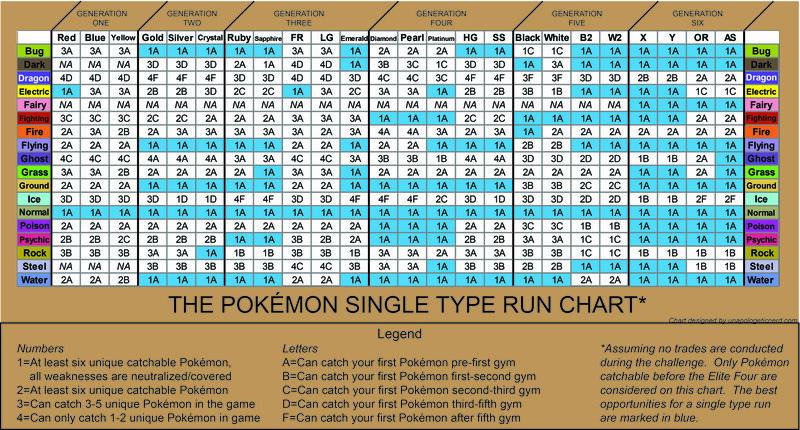 TL:DR-I looked at every fully evolved, non-legendary, Pokémon and noted who can learn moves with 70 BP or greater. I then divided the Pokémon up to their respective types to determine which types had the greatest move diversity. Dragon type Pokémon had the greatest move diversity averaging 11 types per Dragon Pokémon, followed by Fighting (10.39), and Normal (9.93). Grass Pokémon had the least diversity learning on average 6.67 types per Grass Pokémon followed by Electric (6.92), then Bug (6.95). 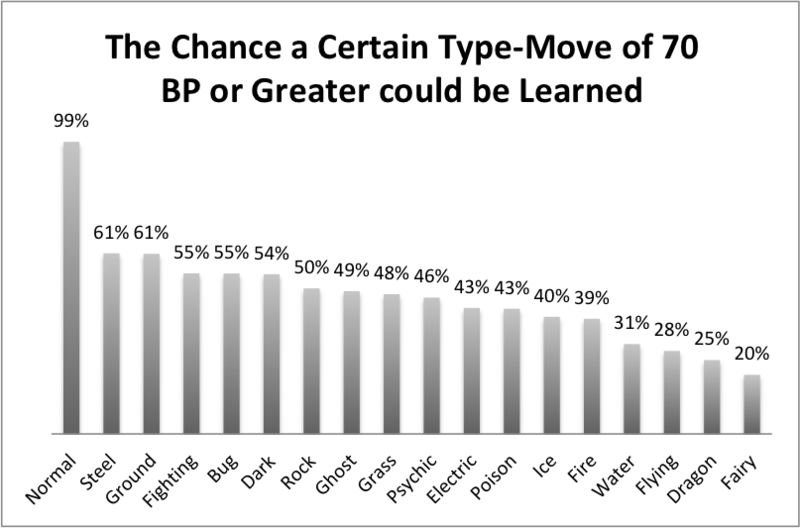 On average, 99% of Pokémon from each type can learn a Normal type move of 70 BP or greater. The next most common type was Ground and Steel (61%). 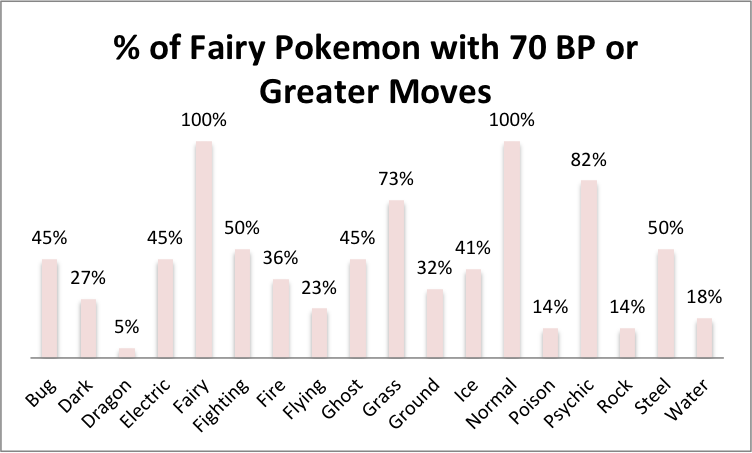 On the opposite end, on average 20% of Pokémon from each type could learn a Fairy move of 70 BP or greater, followed by Dragon (25%), then Flying (28%). I think a lot of Pokémon fans, whether consciously or subconsciously, are aware how some Pokémon types have a greater move diversity than others. Grass Pokémon don’t seem to expand beyond Grass and Poison moves, Ground Pokémon can learn a lot of Rock moves and vice versa, and Fighting types can learn a lot of elemental punches. But I was wondering, well, which Pokémon does have the greatest move diversity? And furthermore, what are the most common types a Pokémon will likely to learn? This is the question that my project hopefully answers. Or at least begin to answer because there are a lot of ways to document a Pokémon’s movepool. Going through every different move would be exhausting on my part and will probably lead to a not very satisfying answer. To streamline the process I look at only moves with a 70 base power (BP) or greater a Pokémon can legitimately learn through Leveling Up, TM, Egg, Tutor, or even Transfer. I want to focus on attacking moves as that was what I was most interested in and I wanted to additionally focus on strong moves as most of the time, on a general playthrough of the games, people would probably focus on these moves and get rid of the weaker ones. So this takes away obvious moves like Scratch to Aerial Ace but I also weeded out certain multi-hit moves like Double Slap (which doesn’t guarantee 70+ power), Rollout (which takes time to get to 70+) but left in Dual Chop (as 40 x 2 = 80). I also did not take into account a Pokémon’s ability (like Technician) as that would cause additional headaches and would wobble the playing field a bit. I also eliminated Legendary Pokémon as they can heavily tilt certain types to much higher type distribution. Types like Dragon, Psychic, and Flying can get an unfair advantage from these heavy hitters while Poison and Bug Pokémon are more likely to miss out. Eliminating these Legendary Pokémon gives us a better idea what the “average” Pokémon can learn. The information was provided from Pokémon Database with all the information coming from Ultra Sun/Ultra Moon. 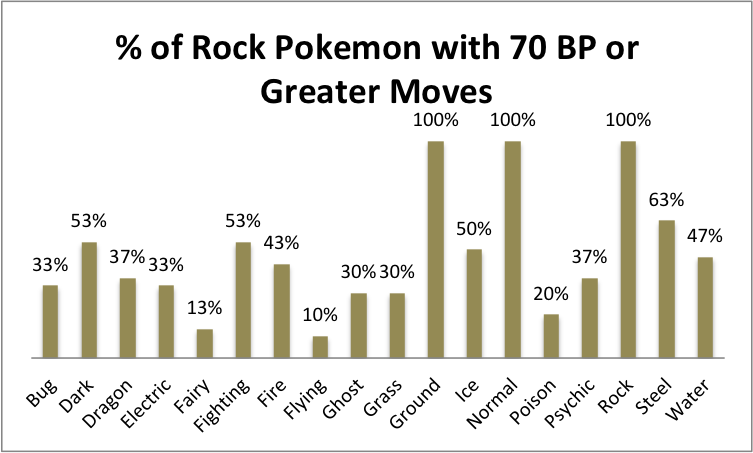 Check out the document for the detailed reports but basically, about 99% of Pokémon from each type can learn a Normal move with 70 BP or greater (this is thanks to moves like Façade, Slash, Hyper Beam and more). Much further behind, with very similar scores, is Steel and Ground with 61%. Steel type moves get a boost from random moves like Steel Strike or Iron Head that seem to pepper random Pokémon. 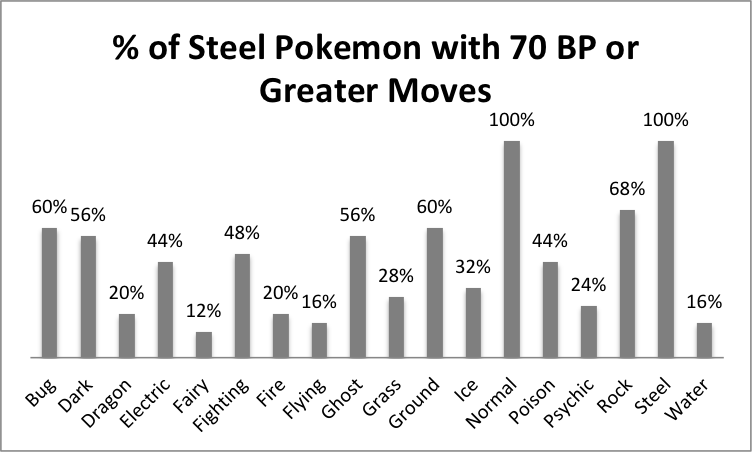 74% of Flying Pokémon can learn a Steel move thanks to Steel Wing (and in fact, if it wasn’t for the Bug Pokémon, that percentage would be much higher). The main reason why Steel is so popular is Iron Tail which has an incredible range of Tutor-potential Pokémon. Meanwhile, Ground type is popular thanks to the ubiquitous Earthquake TM. If you’re a large Pokémon, chances are, you can learn Earthquake! Smaller Pokémon can learn Dig and the new Stomping Tantrum has an incredible range of Tutor-potential Pokémon. Random Pokémon like Delcatty, Komala, and Dodrio can now learn strong Ground moves because of which. On the flip side, about 20% of Pokémon from each type can learn a Fairy move; this is probably because Fairy was introduced only recently and there are only three moves, Moonblast, Dazzling Gleam, and Play Rough that are common enough for a Pokémon to learn. 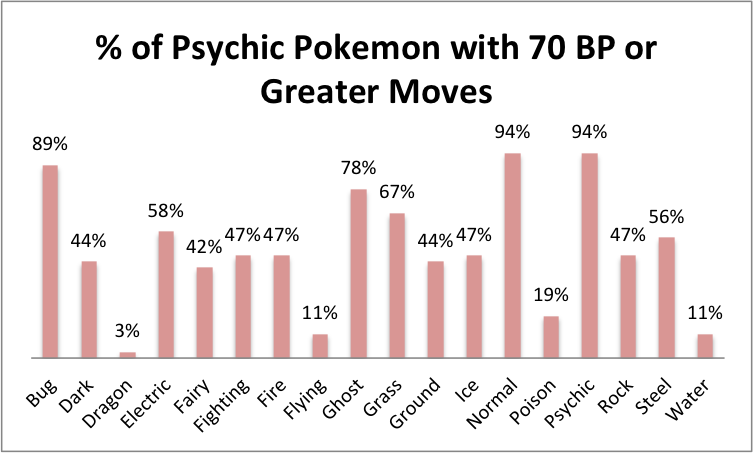 Psychic types have the second highest rate of Fairy moves at 42% which is abysmal! So if it feels like you’re having a hard time trying to find a Pokémon that learns a Fairy move, that’s not you, it’s the games. The second rarest move, Dragon, comes in at 25% because of the extreme rarity of its moves (that are not unique to legendaries). The main reason why they’re peaking at 25% is because of Outrage and Dual Chop. Outrage can be learned via Move Tutor and TM by Pokémon with anger issues; Dual Chop can be learned via Move Tutor by Pokémon with fists. 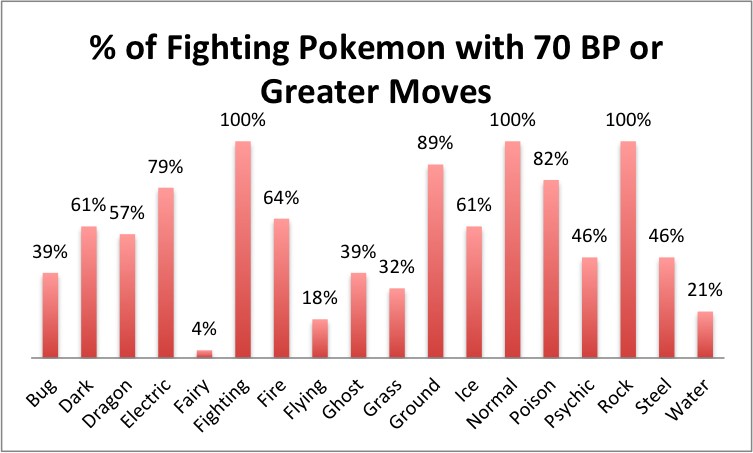 To further illustrate my point, 57% of Fighting Pokémon can learn a Dragon Move of 70 BP or greater primarily because of Dual Chop. Bringing up the rear, we have some Pokémon that can learn Dragon Pulse via Move Tutor or TM like Clawitzer. 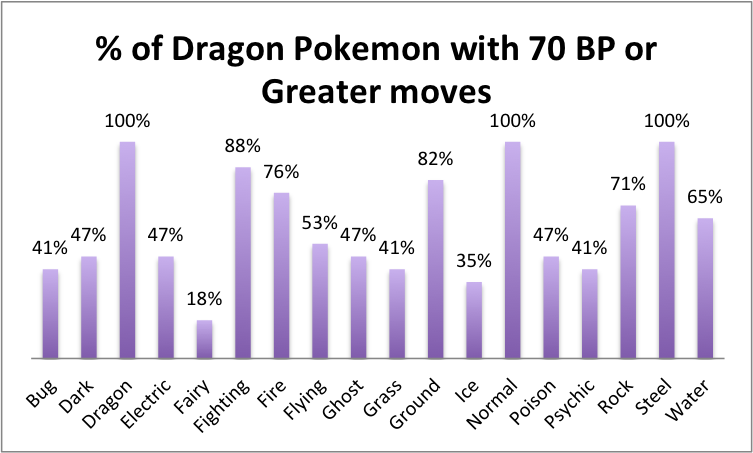 Dragon Pokémon had the highest move diversity by far with an average of 11 moves per Pokémon while Grass had the fewest with 6.67 per Pokémon. Let’s take a look at each of these types going from most to least diversity along with each type’s best and worst Pokémon. Thoughts: Dragon Pokémon being the #1 most diverse type I think should not surprise many people (Drampa is the #1 most diverse Pokémon according to the rules here, we’ll see it again in the Normal section!). They are very strong and they aren’t specified for one gimmick or purpose. So again and again we see Ground, Fire, Rock, and Fighting moves dominate the Dragon Pokémon. The fact that they broke 11 moves as a mean is pretty amazing and only four of the 17 Dragon Pokémon have less than 10 different type moves. They are powerful creatures that can control powerful forces. Most interesting is Dragon’s 100% rating for Steel moves; what’s going on here? Well a few things give Dragon a perfect Steel rating. First is Steel Wing and the plethora of Dragon/Flying Pokémon. Additionally, Iron Tail makes a strong showing along with Iron Head. This is fantastic given Dragon’s Fairy weakness. Many times, a Dragon can learn more than one Steel Move which further illustrates how diverse they are. It’s pretty funny how only 18% of Dragons can learn a Fairy move. Man do they dislike the Fae! I mean, Fairy IS the rarest type but still. I guess not many Dragons like to Play Rough or are feeling Dazzling Gleam. Only three Dragons can learn a Fairy move; Altaria, Drampa, and Dragalge. I’m not surprised about Altaria or Drampa but Dragalge? Really??? But yes! They get it by, of all things, breeding with an Azumaril who knows Play Rough. Hilarious to think they’re compatible! Thoughts: Another 100%? How exciting! But yes, every Fighting Pokémon can learn a Rock move thanks to Rock Slide which works well against the birds. Additionally, Fighting has such a superb move distribution and not just because of the elemental punches. Earthquake, Dual Chop, and Throat Chop are just some examples. In fact, 82% of Fighting Pokémon can learn a Poison move thanks to Poison Jab. Again, no surprise on the rarity of Fairy moves, only Gallade can learn a Fairy move. Going up the ladder, only five Fighting Pokémon can learn a Flying move, Hawlucha, Blaziken, Hitmonlee, Toxicroak, and Mienshao and they ALL know Bounce! I’m honestly surprised other Fighters don’t jump on the Bounce-wagon. Thoughts: I honestly thought Normal would be #1 but Fighting and Dragon had a very strong showing and Normal suffered from some weird Pokémon (no judgment). 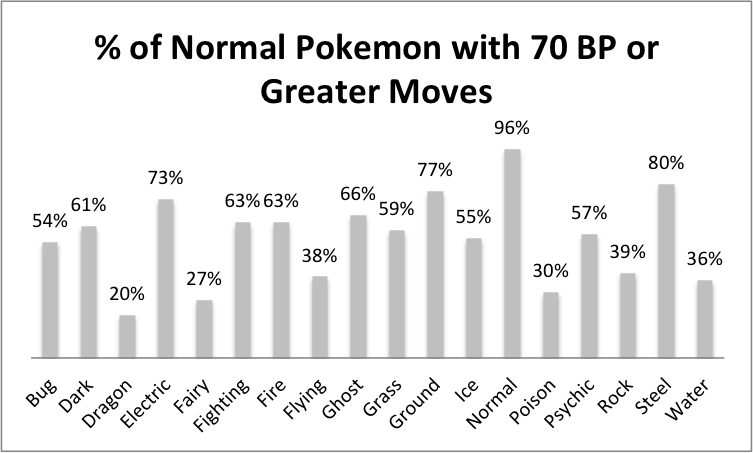 But regardless, the Normal type had the most consistent move percentages out of any type. Its standard deviation, which shows how diverse a certain set of data points are, was the lowest among all 18 types. To better illustrate what I mean, look at Normal’s graph and now look at Bug, Grass, or Electric’s graph. In those charts we’re seeing a few highs and a lot of lows but for Normal, we’re seeing a lot of type percentages that are near each other. This is showing us that Normal Pokémon don’t really favor one type or another besides itself. Yes, there are a few lows but overall, pretty good consistency. What this data is telling us is what we all knew for years. Normal Pokémon can learn a huge diversity of moves. They may be lacking in certain areas but overall, when you train a Normal Pokémon you’re more than likely be able to teach it quite a few different type moves. Thoughts: I’m honestly shocked that Dark ranks #4. I thought Ghost or Psychic would be up here and Dark would be further down. 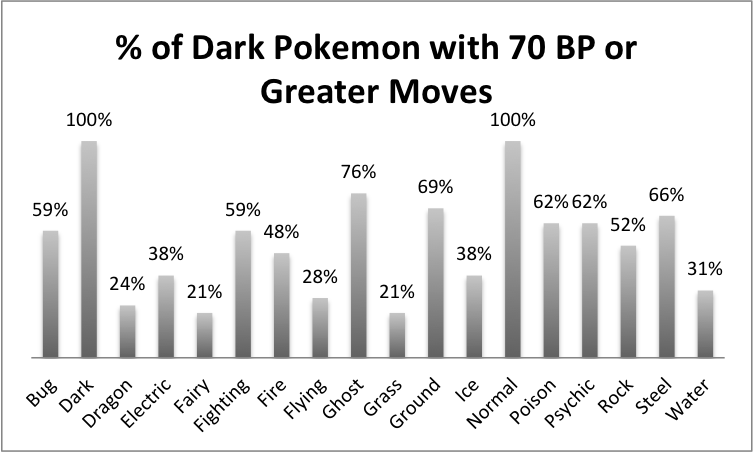 But Dark consistently ranked over 50% for many types like Ghost (Shadow Ball/Claw), Psychic (Psychic), Bug (U-turn and X-Scissor), Poison (Poison Jab), Steel (Iron Tail), and Ground (Earthquake and Dig). Dark Pokémon also have a lot of type and design variability creating a great concoction to learn a variety of moves. 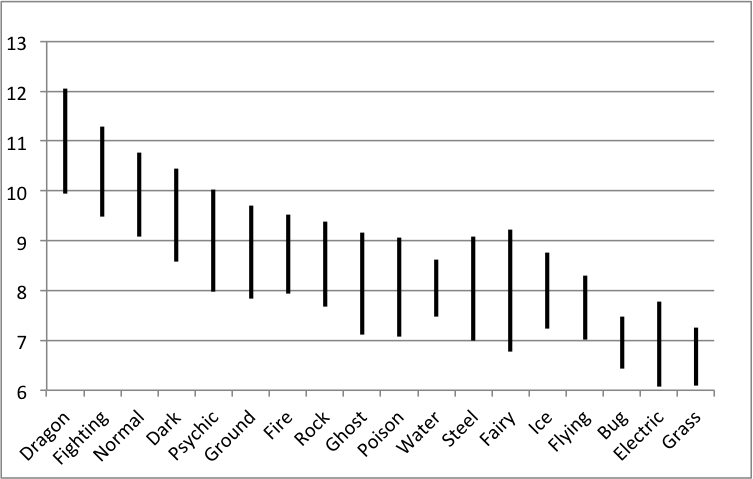 Even it’s lowest type, Fairy at 21%, is still better than the previous three types’ worst move type. I’m not surprised though that Ghost is its third highest as these two types seem almost interchangeable at times. Shadow Claw and Ball fit in neatly with the grim, moody, and nocturnal aspect of Dark Pokémon. Spiritomb sitting with just four moves shocks me. You’d think that Gamefreak would take pity after Fairy was introduced and give Spiritomb and few more moves. As of right now, it can learn Dark, Psychic, Ghost, and Normal above 70 BP and that’s it. Hey Pangoro, wanna give up one of your moves? I think you got enough! Thoughts: The first thing that stands out here is Psychic’s huge fondness for Bug moves. That’s very odd and I would have never predicted that. But here’s the thing, Signal Beam is the most common move a Psychic Pokémon can learn. Why? I don’t know! It’s one of those odd attacks that just found a niche in another type’s home. Following Bug we have Ghost (78%) thanks to Shadow Ball, and Grass (67%) with Energy Ball and Giga Drain. 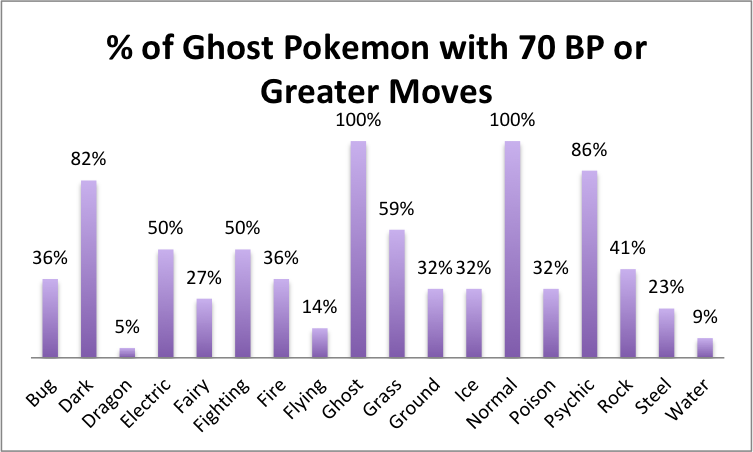 I honestly though Ghost would be much higher but you have the likes of Bruxish, Alolan Raichu, Exeggutor, and, of all things, Malamar who do not learn any strong Ghost moves. Fairy is also a weird type to talk about. First, only 42% of Psychics can learn a Fairy move but that’s the highest percentage an attacker can learn after Fairy itself! I’m honestly shocked it’s not higher, I thought these two types go hand in hand. Still though, Moonblast and Dazzling Gleam are popular moves that fit well in the Psychic mold. Also, no surprise, that Dragon is Psychic’s worst move. Psychic Pokémon don’t really scream DRACONIC to me. And because we eliminated the likes of Lati@s we lost some good sources for Dragon moves. Only Gallade can learn a Dragon move and even then, it’s Dual Chop. Thoughts: We reached the point in our rankings where the types on average learn less than half of available type moves. We’ll start to see types that are either all or nothing for certain learned move types. We are still treading pretty well though and in fact, it will be a gentle decline in stats before we hit the last four types. You may be wondering who is the one Ground Pokémon who can’t learn a Rock move, well it’s Wormadam-Sand Cloak variant. This is such a weird exception that you can basically guarantee that whoever you’re training, your Ground Pokémon can learn a Rock move whether it’s Rock Slide, Head Smash, or Stone Edge. Good on them! No wonder Flying Pokémon have a hard time surviving. Steel and Fighting moves are very common as well which further protect Ground Pokémon from any potential weaknesses. There are only two Ground Pokémon that can learn a Fairy move, Donphan with Play Rough and Claydol with Dazzling Gleam. That’s it. This is probably because there’s only one family line of Ground/Psychic and no lines that are Ground/Fairy. I myself trained a Donphan with Play Rough thanks to ORAS’ cool catching mechanism and that was fun. Thoughts: We reached the middle tier but I’m still surprised how high Fire is on our list. I thought it would be Grass moves and that’s it. But you have that and a strong showing of Ground and Steel moves and more than half of Fire Pokémon can learn a powerful Electric move as well. Back to Grass, we have Solar Beam and Energy Ball that are easy additions to Fire Pokémon thanks to the moves’ sun reliance. Watch out Water Pokémon! Water, Ice, and Fairy were each learned by one unique Fire Pokémon. Delphox (our Fire/Psychic) can learn Dazzling Gleam via TM. Emboar can learn Scald via TM, which really, why the heck can’t other Fire Pokémon learn Scald??? As far as I can tell, there’s nothing really special about Emboar and steam…it’s odd. Even odder, and I’m going to get flak from this, is Alolan Marowak, the only Fire type to learn a strong Ice move by a technicality. You see, if you teach a Cubone in Red, Blue, or Yellow Ice Beam by TM, you can transfer it over via Pokémon Bank to the Alola Region and then evolve it into an Alolan Marowak. And it still has the Ice Beam move! These move transfers happen very rarely and Cubone is one of them, thankfully. Other than that, there is no way you can teach a normal Fire Pokémon a strong Ice move. Thoughts: We’re moving into territory where the main type can learn a few types very well but the rest are okay or poor. Rock shows this in spades as Ground and Steel (63%) are common moves for it. Rock’s 100% Ground coverage I think reflects these two types very close relationship (to the point that it can seem interchangeable). Even weaker, smaller Rock Pokémon, like Carbink, can still learn moves like Stomping Tantrum. I’m honestly more surprised that Steel isn’t more common. The Rock Pokémon overlooked Flying moves even though this would help them against their weaknesses. Archeops and Aerodactyl are your two main Flying-attackers but Relicanth snuck in with a Bounce move that it probably shouldn’t have. Thoughts: Ghost and Psychic Pokémon are basically buddies as they can learn each other’s moves (only Aegislash, Decidueye, and Dhelmise cannot learn any strong Psychic moves). We also see a very high rate of Dark (82%) moves and a surprisingly strong showing from Grass (64%) moves (Energy Ball and Giga Drain are favorites here). Also, Golurk’s Ground/Ghost pairing gives it sooo much variability in its moveset. The humanoid shape throws in some elemental punches as well. Alolan Marowak is the only Ghost Pokémon that can learn a Dragon move (Outrage). There are also only two Ghost Pokémon that can learn a strong Water move, Jellicent (obviously) and Dhelmise (which makes sense given its shipwreck esthetic). Thoughts: I honestly thought Grass and Dark would be a bit higher for Poison Pokémon given their predilection towards malicious and parasitic tendencies. On that thought, here’s the problem with Poison Pokémon move diversity; a lot of them are paired with Grass or Bug Pokémon which don’t have the best move selection. Most Poison Pokémon that have a great move selection are those that do not belong to this type excepting Scolipede’s 10 moves. Even pure types like Weezing, Arbok, or Muk have a better move selection than those dual types. That said, Toxapex is the footnote to this idea. Good lord does it not have a good attacking movepool which is fine given its preference towards defense. Other defensive Pokémon have this trait as well. And come on Bug/Poison Pokémon, a lot of you have wings! Use them to learn Flying moves! Ariados has a Flying move and it’s Bounce for Pete’s sake! Thoughts: The sheer diversity of Water Pokémon buoyant this type as well as it could but it still suffers from low movepool selections. Regardless, all but Pyukumuku could learn a Normal, Water, and Ice move giving Water Pokémon a leg up against Grass types. 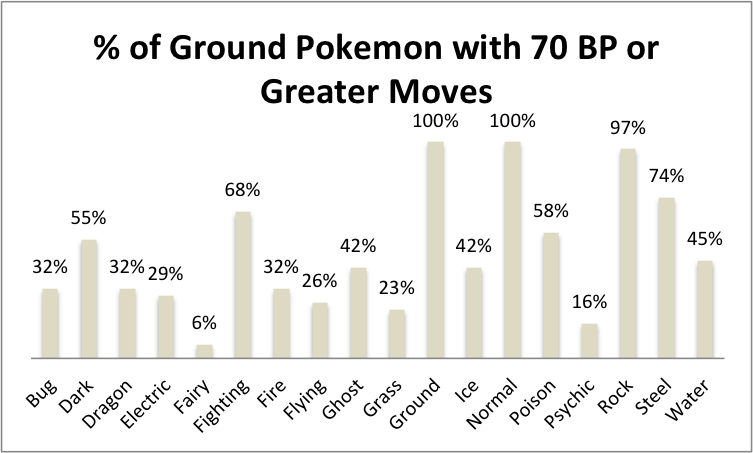 Over half can learn a strong Ground move as well, furthering their type coverage (we have a lot of large Water Pokémon and quite a bit Water/Ground types). There are five Water Pokémon that can learn a Fire move and they’re Octillery, Slowbro, Slowking, Gyrados, and Ludicolo. Ludicolo is the one that surprises me the most out of this bunch. I guess pineapples have fiery fists. Thoughts: Darling favorite, Lucario stands tall amongst the Steel Pokémon along with ceratopsian-inspired Aggron. I find it interesting that so many Steel Pokémon dropped the Rock Slide ball and just didn’t make an impressive statement for its Earthy counterpart. Hopefully next generation will improve their Rock movepool. There are just three Steel Pokémon that can learn a strong Fairy move; Klefki, Mawile, and…Probopass? Really? And it’s Dazzling Gleam?? Okay, hold on. If Probopass can learn Dazzling Gleam…why can’t Magnezone or Klinklang learn it as well since they both know Flash Cannon, Signal Beam, and Electric moves?? Odd. Thoughts: Fairy is a weird type as there are still not a lot of them available and they’re all so different. The variation in the data is wild as you have a some who know little or some who know a lot. I guarantee you Fairy Pokémon’s move diversity will drastically change the following generation once we get new Pokémon to analyze. I frankly wouldn’t be surprised if Fairy Pokémon found themselves averaging 9 moves. Also, I too was shocked that Granbull was the #1 spot for Fairies. Granbull additionally is the only one to have a Dragon move (Outrage). Clefable has a pretty good move diversity though (13) which is probably a tie over from its days of being a Normal type. A lot of Psychic love here but we also have about 3/4th of the Fairy Pokémon sporting a Grass move. The stories and legends of Fairies and their mushrooms and forests translated well for Pokémon. Few Poison moves from this type (doesn’t quite bode well with living in harmony of the forest) but 50% of them can learn a Steel move! I guess Fairies are a bit ambivalent when it comes to forged metals. Thoughts: The fact that Ice Pokémon is not in the bottom three speaks volumes of how restricted other types can be. Ice Pokémon diversity gives them a boost that Electric and Grass types sorely need. The hard and durable Ice type are big fans of Steel moves and we see a lot of Smart Strike, Flash Cannon, and Iron Tail moves among the cold Pokémon. It’s…somewhat useful…I guess but at least over half can have a Ground move. With the abundance of Water/Ice types we also see a plethora of Ice Pokémon that can easily learn Surf (much more useful against the Fire Pokémon). I think I speak for all of us when I say we’re ready for a Fire/Ice Pokémon. What would it look like? Not sure, maybe an icy volcano? 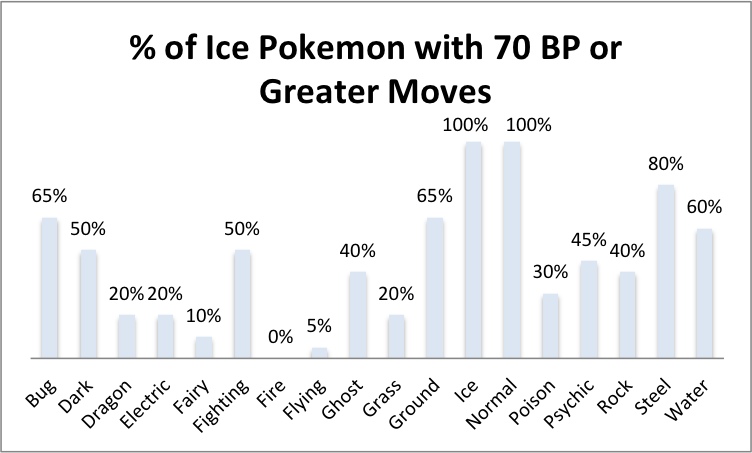 Still, none of the Ice Pokémon in this survey can learn a strong Fire move (a trait that the Fire Pokémon would also have for Ice moves if it wasn’t for Alolan Marowak). Delibird is the only Ice type here that can learn a strong Flying move and that’s about it. None of the agile Ice Pokémon can even learn Bounce. Thoughts: Diversity did NOT help Flying Pokémon too much for move variability. The problem is that so many of these Pokémon are just so specialized in design or purpose that they can’t expand outwards. Emolga, Drifblim, and Jumpluff are just a few of the Flying Pokémon sitting with 5 moves. You also have a handicap of consistently being paired up with Bug which also doesn’t have the best move diversity (and they can’t even learn strong Flying moves!). 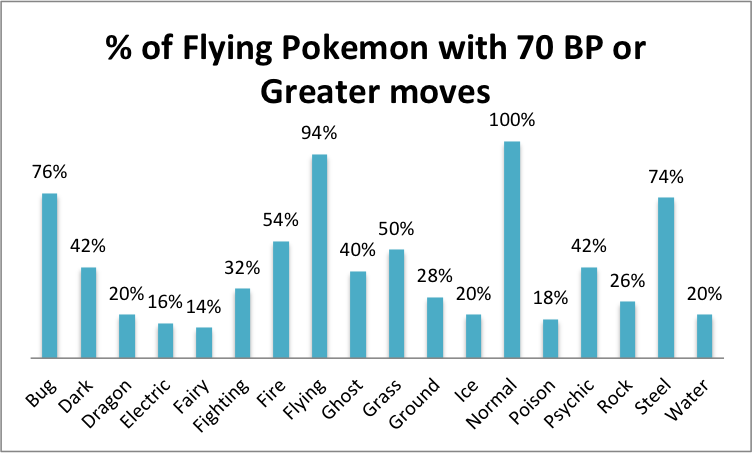 Regardless, Flying Pokémon have a high rate of Bug moves not just because of the insects but because of U-Turn as well, a favorite for fast hitters. And oh man! Steel is at 74% thanks to Steel Wing! A very handy move against Ice and Rock types. And as a quick shoutout, a lot of Flying Pokémon can learn Heat Wave via Move tutor, just found that interesting. Thoughts: We reached the bottom three of our list with each of these types, on average, learning less than 7 type moves per Pokémon. I look at this graph and I see a few (typical) highs but a lot of lows. Since the beginning of the series, Bug Pokémon have been considered weak, ineffectual, and subpar, and unfortunately, this data does not convince otherwise. But that’s why we can’t always rely on one set of data points. Sure, Heracross, Volcarona, and Scizor does not learn many moves, but are they weak? I definitely wouldn’t say that. And Golisopod and Scolipede have both the diversity and the strength to make for some fun Pokémon to train! And on a personal level, I love Dustox and took one to the Elite Four despite its move limitations. Grass moves like Giga Drain pair nicely with the sometimes parasite tendencies of Bug Pokémon. Over half of Bug Pokémon can also learn a strong Dark move, like Crunch or Night Slash further countering Psychic Pokémon. On the other end of the spectrum, only Golisopod can learn a Dragon move (Dual Chop) and Volcarona can learn multiple fire moves. 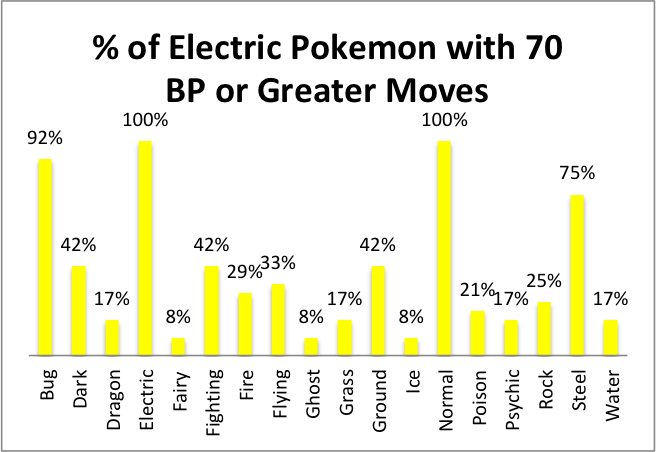 Thoughts: Electric Pokémon have the biggest disparity between move abundance, you either know it or you don’t. Electric types love their Bug and Steel moves but everything else is a soft fart. Why? Signal Beam (Bug) and Flash Cannon (Steel) pair nicely with the energy and laser based attitudes of Electric Pokémon. So many of them can learn these moves even by simply Leveling Up which is nice. This is why I’m confused Dazzling Gleam isn’t more popular, especially with this crowd. Eelektross has a fantastic move diversity and is one of the reasons why I love it so much. In fact, Electivire can learn 11 moves so you don’t need to have a secondary type to boost your diversity. Unfortunately, Electrode did not get that memo and is stuck with only four moves. 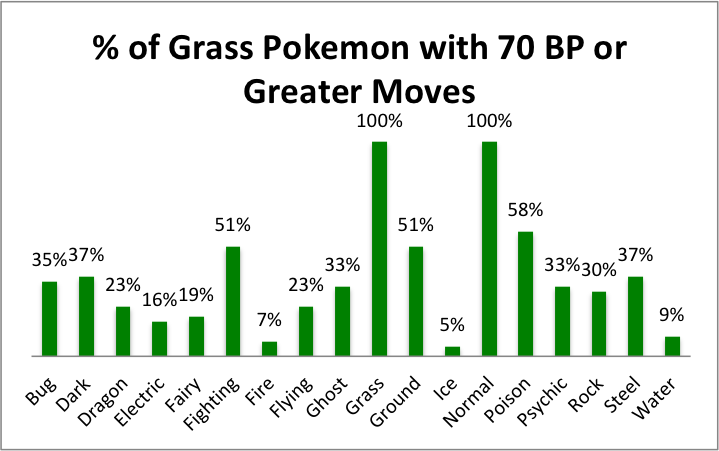 Thoughts: And we come to the end of our list, Grass Pokémon have the smallest type diversity movepool of 70 BP or greater. 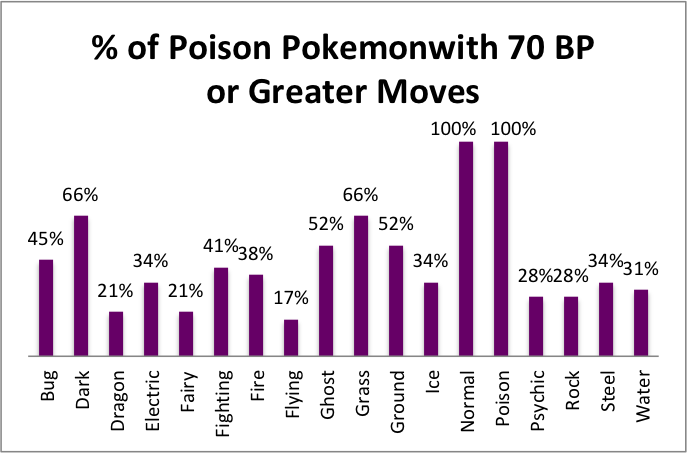 Even Poison moves don’t crack 60% despite the plethora of Grass/Poison types. Beyond that, we have Fighting and Ground peaking above halfway at 51% but everything else is less than half. So who are the lucky few that can learn Ice or Fire moves? On the Ice side we have Abomasnow (of course) and Ludicolo via TM (thank you Water Type). Then on the Fire side we have Gourgeist (pumpkin theme coming in strong), Alolan Exeggutor (Dragon), and again, Ludicolo (who can already learn an assortment of odd moves). As Sword and Shield arrives to us later this year, I would hope that Grass Pokémon can catch a break. Realistically speaking, Grass Pokémon should be able to learn Fairy moves given their strong ties to nature. 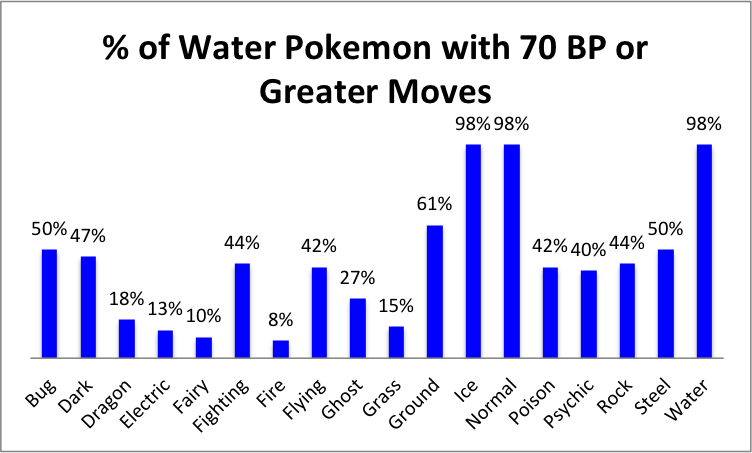 I would also like to see more Water moves as well due to their strong desire for water to keep them alive. 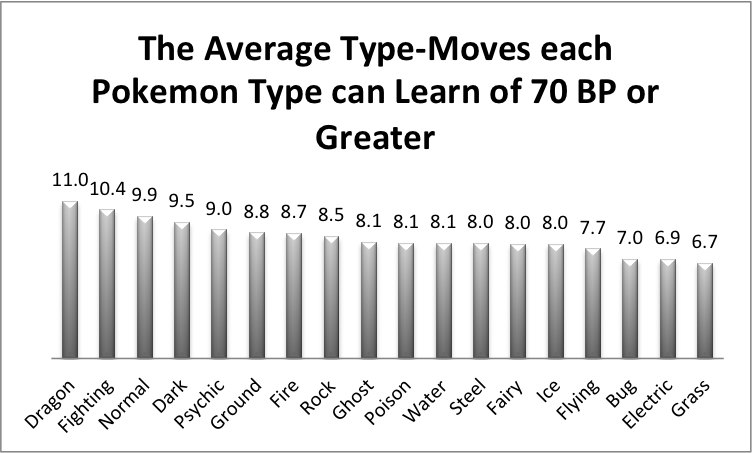 The mean and confidence interval of the average number moves each Pokemon Type can learn of 70 BP or Greater. Take a look at the above graph, it shows the average different types an attacker can learn. The lines represents a 95% confidence that the mean falls within this zone. What does this mean? Well there is a looooooot of overlap. I guarantee that by next generation, many of the attacking types’ ranks will change, maybe even drastically. Dragon could fall to 3rd place while Fairy could jump to the upper third. Why is there a lot of uncertainty in the data? Primary, it’s because, after we weeded out all the legendaries and the not-fully-evolved Pokémon, we are left with less-than-robust numbers that lead to shaky data points. 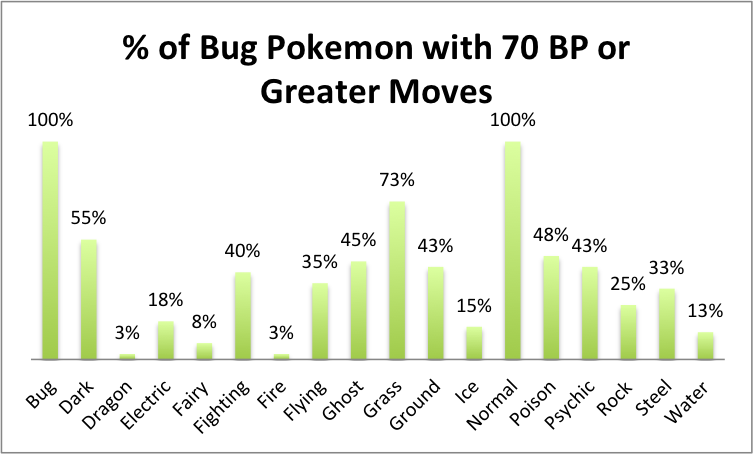 Bug and Water have probably the statistically strongest data points due to Water’s vast numbers and the almost consistent number of moves each Bug Pokémon can learn. Fairy is just all over the place as there’s hardly any of them and we see a big range of Fairies learning a few moves or a lot of moves. 70 BP was such a brutal cutoff for a lot of different types. If I had pushed it to 65 BP we would have seen a huge boost in type diversity with Bubblebeam, Knock Off, Fire/Ice/Electric Fang, and Psybeam. But if I had pushed it up to 75 BP then we would’ve lost U-turn, Steel Wing, Sucker Punch, Shadow Claw, and Night Slash. I’m pretty darn sure Flying Pokémon would be dead last in move diversity without Steel Wing and U-turn. Dark and Ghost Pokémon would also tumble downwards in their diversity. Without the Steel move support, Ground moves would be by far the second most learned type. Looking at the data, I still think I did right with that 70 BP cutoff but whose to say? This is, after all, just my point of view and not the tried and true method of measuring a Pokémon’s diversity. This research took a long time for me to do but I liked it. Just a fun project on the side for me to do without any major stress or deadlines to it. I tried my best to ensure its accuracy but if you have found mistakes in my data let me know and I’ll fix them! I won’t be offended at all. I can’t imagine myself doing a project like this in a long while but thankfully, this data will be continuously useful to me as I’m still writing my Single Type Run articles. 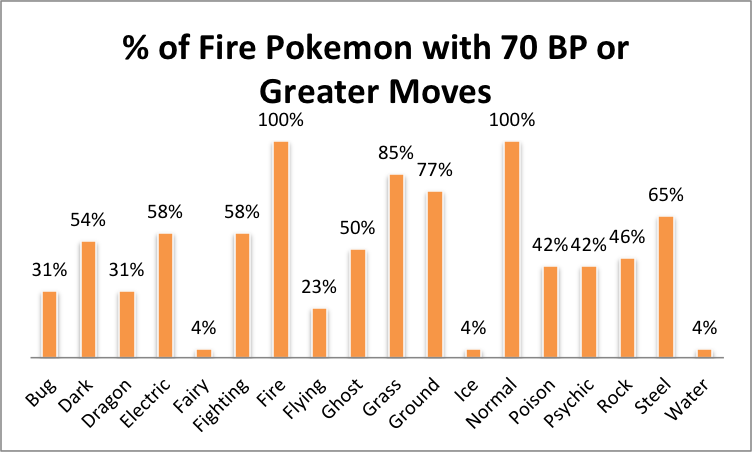 When I’m focusing on a particular type, like Fire for instance, I can go to my data, look at the Fire type, and understand which Pokémon have the best move diversity and which Pokémon you might avoid. I hope you enjoyed this article and I look forward to hearing about my mistakes! This entry was posted in Pokemon, Video Games and tagged 70 BP, Bug Type, Dark Type, Dragon Type, Electric Type, Fairy Type, Fighting Type, Fire Type, Flying Type, Ghost Type, Grass Type, Ground Type, Ice Type, Nintendo, Normal Type, Poison Type, Pokemon, Psychic Type, Rock Type, Steel Type, video games, Water Type on March 15, 2019 by Andy.